Porsche reportedly working on new turbocharged flat-four boxer engine? These days, we’ve seen just about every automaker dropping cylinders in an effort to appease tightening fuel economy and emission standards – and Porsche is no exception. Nearly three years after introducing an all-new V6 powerplant under the front hood of its Panamera sedan (launched with a range of V8 engines) comes word that Porsche is working on an all-new turbocharged flat-four boxer to replace the flat-six engines mid-mounted in its Cayman and Boxster models. 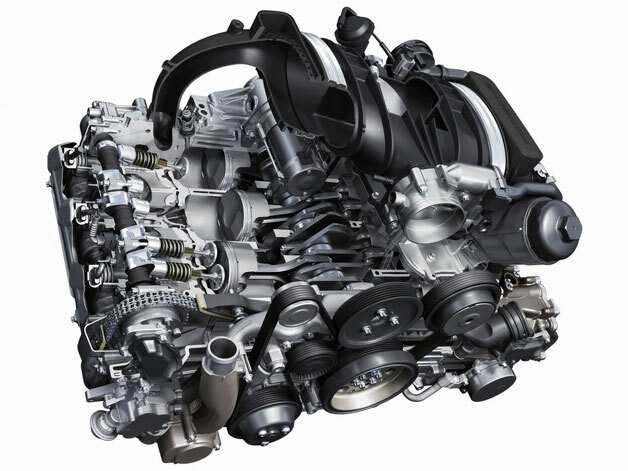 Specifics have yet to be learned, but reports say the engine is a derivative of the current 3.8-liter six (shown above) found under the rear decklid of the Carrera S, yet with two fewer cylinders. Fitted with a turbocharger, direct-injection and the automaker’s VarioCam Plus, the new all-aluminum 2.5-liter flat-four will likely develop upwards of 350 horsepower and 360 pound-feet of torque. Redline should be about 7,500 rpm. Initial indications say that Porsche will only offer the new engine with its seven-speed PDK dual-clutch automatic, tuned to take advantage of the low-end torque, but a traditional six-speed manual gearbox has not been ruled out. Despite the loss of two cylinders, enthusiasts will likely embrace the new engine as it promises to be lighter, more fuel efficient and more powerful than the 2.7-liter and 3.4-liter sixes in the Cayman/Boxster today. Even though Porsche has been using Volkswagen Group engines for years (e.g., Cayenne V6, Cayenne Diesel and upcoming Macan), all indications are that the new flat-four will not be shared. Instead, it will be kept in-house for the automaker’s sports cars and possible future fitment in an entry-level 911. Porsche reportedly working on new turbocharged flat-four boxer engine? originally appeared on Autoblog on Wed, 10 Apr 2013 11:31:00 EST. Please see our terms for use of feeds.